Yes, under the New Covenant, we are not under The Law. Unfortunately, most professing Christians are also not under Grace. Is it your lack of success being holy? No. It’s your lack of failure. Because thine heart was tender, and thou hast humbled thyself before the LORD, when thou heardest what I spake against this place, and against the inhabitants thereof, that they should become a desolation and a curse, and hast torn thy clothes, and wept before me; I also have heard thee, saith the LORD. Grace is the unmerited favor of God towards mankind. And Grace denotes beauty – visual appeal. In fact, the introduction of Grace in the Old Testament (Covenant) repeatedly describes ‘grace’ as visual appeal. …or are we under Grace? Do we have that beauty? And what is that beauty? We have wisdom when we see ourselves as God sees us. God sees us as his wife, his woman. As a woman, how are we beautiful? By finding, knowing, and rejecting the ugly. First: recognize that evil exists in this world (and in yourself). And make the decision that you’re going to be part of the solution. You’re going to conquer your own failings and also help the world. By your best efforts, you’ll be the best you that you can be! …but what I hate, that do I. …So then with the mind I myself serve the law of God; but with the flesh the law of sin. Are you really winning against the enemy? If you’re honest, that good that you sought to perform isn’t helping anyone… as you’re losing, and the world around you is losing. Abraham learned the hard way. God told aged Abraham that he and his elderly wife would finally have a child – a son of promise, and Abraham would be a father of nations. And Abraham did have faith and believed God. But, like us, Abraham went forward with goodness – his own ‘good’ works, rather than waiting and doing it God’s way. Abraham listened to his wife and took handmaid, Hagar, as a wife. …rather than the eventual Covenant son of Abraham: Isaac. As then, and to this day, Ishmael’s Muslim people surround and occupy much of God’s promised land, Israel. Our own efforts will always result in an Ishmael, rather than an Isaac. You might be losing for many years and decades. You might have been failing for so long that your heart is broken. The only acceptable good is from God. Jesus did not die from being crucified. Unlike others crucified, Jesus did not need his legs to be broken to die; he was already dead. How did Christ die? He died of a broken heart. Christ was cut off from the only true goodness, the Father. After taking our sin, for the first time, the Father would not answer Christ. Christ forever became a man. …he will judge the world in righteousness by that man whom he hath ordained… he hath raised him from the dead. As a man, like us, Christ identifies with those of us who cry out, and are cut off from God. Christ has favor upon the broken hearted. The broken cry out for righteousness. The broken fill their hearts by speaking the word of God, but break their hearts by realizing how we fall short. The broken look in the mirror, and see their own true condition. The broken realize that their own works, and their adherence to any rules or laws will only result in failure. The broken realize that the human condition will never be solved by our own works, and righteousness will never come by our adherence to rules or laws. Even with the perfect Law of Moses, we fail. In this dark world, we cannot find who, what, or where God is. And the broken finally cry out to the only righteousness (from God) that will solve the human condition… but are truly broken hearted as when we cry out… God does not answer. God does not answer because we are cut off from God – because The Law stands in our way. We are cut off from God by committing just one sin under The Law. Cursed is every one that continueth not in all things which are written in the book of the law to do them. Christ understands as he was cut off too. When Christ took our sin, God cut Christ off, and God would not answer Christ. But, unlike us, Christ (the only perfect man who was not guilty under The Law) had the power to take up his life again. No man taketh it from me, but I lay it down of myself. I have power to lay it down, and I have power to take it again. We, however, are guilty under The Law, and must die. But, when we are dead to The Law, it has no more punishment to give us. And, as a woman, we can marry Christ to be the bride of Christ. …but if her husband be dead, she is free from that law; so that she is no adulteress, though she be married to another man. Like a married couple, our debts (like a mortgage) are legally accounted for by our husband. Justified means: just as if we never sinned. God’s people will have his Law written on their hearts. …I will put my law in their inward parts, and write it in their hearts; and will be their God, and they shall be my people. Forasmuch as ye are manifestly declared to be the epistle of Christ ministered by us, written not with ink, but with the Spirit of the living God; not in tablets of stone, but in fleshy tablets of the heart. But what is this Law? The Law is a broken Law. When Moses returned to his people with the tablets of the ten commandments, his people had already broke the first and second commandments by worshipping a false god. In anger, Moses broke the tablets. So I turned and came down from the mount, and the mount burned with fire: and the two tablets of the covenant were in my two hands. And I took the two tablets, and cast them out of my two hands, and brake them before your eyes. This Law is a broken Law written on broken hearts. A broken Law for a broken heart. A broken heart for a broken Law. 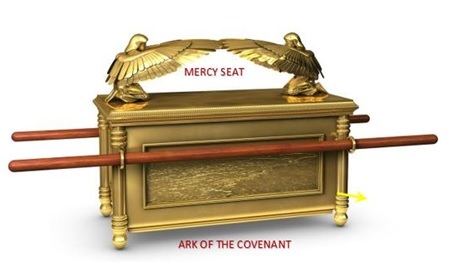 But those tablets of The Law, which were broken and then re-created, sat right below the Mercy Seat (in a container of the same dimensions as the Seat). But the unfortunate reality is that most professing Christians do have their rules (mostly based on The Law) and also hope for Grace. Rules have their place, but they will never make you righteous in the eyes of God. Faith is counted as righteousness for Grace. Grace is a free gift – but is not cheap. And God doesn’t give it to just anyone. If you follow The Law – you must follow of all of it. But faithfully, we are to follow the Holy Spirit regarding rules and guidance for our individual lives – including how to apply The Law in everyday situations. If you remain under The Law (circumcised), you no longer cling to Grace via faith, and you fall from Grace. The Law’s circumcision must be for our hearts – broken hearts. Broken hearts for a broken Law. How do we circumcise/cut/break the heart? The power of speech. Confession. We speak our confession (after seeing ourselves in the mirror of the Word and how we fall short of The Law). Sins are only forgiven when confessed. But, confession means much more than just confessing sins. And we are to say the same as God has already said. The words of our mouth are to say the Word of God (Biblical scripture). When we speak the Word of God, we change our heart so that we can be saved. In fact, we limit Christ in our lives when we hold back our confession, our speaking of the Word. But the reality is that most people, professing Christians or otherwise, don’t have that broken heart. You simply haven’t failed enough. God gives up on many people who follow their heart, which isn’t broken (including professing Christians). …or they might be cut down, as they will be by the end. Those who have Grace are linked to Christ. Being a Christian isn’t about effort through our own sweat and abilities. …and his grace which was bestowed upon me was not in vain; but I laboured more abundantly than they all: yet not I, but the grace of God which was with me. Being a Christian is about union with God. How are we joined to God to get this Grace? It’s by failure. It’s by affliction. …we are chastened of the Lord, that we should not be condemned with the world. Proper Christians can be described as Blade Runners. A proper Christian’s path in life can be described as a thin blade. The only way you can know the existence and whereabouts of a blade (your role in life) is by finding its edge. The edge is the point in life where we might fall off. The edge is the point in life where we can’t do it anymore. The edge is our point of failure. The edge is the end of our own ‘good’ works. The edge is the point in life where we need and find Grace. The edge is the end of our life and the beginning of life with Christ. Paul, after being thrown in jail by the authorities, was on the edge (but comforted in Christ). Of course, if God is interested in you, you might be like Jonah. You simply might not be desperate enough yet. You might need more affliction. When God called Jonah, Jonah jumped in his car, and sped out of there. But, God had affliction prepared for Jonah. People who will one day turn to God are like Jonah, trying to solve their problems and the world’s problems on their own. They are trying to solve the human condition via rules which are not given to them from guidance by the Holy Spirit. On their first day inside the fish, they try to escape by their own ability. They aren’t desperate enough. More affliction inside the fish is necessary. So, Christ is the end of any rules that people think will make themselves righteous. In times before worldwide literacy and availability of the Bible, God was willing to look away when people pursued a righteousness that is not of Christ. But nowadays, with worldwide knowledge of Christ, God has justification to subject all of us to that affliction – to drive us to the edge where we are in danger of falling. Render to Caesar the things that are Caesar's, and to God the things that are God's. After affliction, Jonah found the edge of his own ability. He was desperate enough for Grace. Similarly, the proud king Nebuchadnezzar was not trash to God, but, mercifully, God was interested in him. So, Nebuchadnezzar had to go through affliction before being united to God. And when I was arrested and named as a Blade Runner by the Holy Spirit to pray and fast for the Lord… how did I immediately respond? I had to lose quite a bit before I was useful to the Lord. But Grace does not end there. God trains his people by pushing them beyond their ordinary abilities by putting them into difficult spots, where they will need his Grace to succeed. Have you noticed how many women who had the promise of children from God were barren? …and shall Sarah, that is ninety years old, bear? When we are weak (certainly relative to the challenge God has set before us), we rely on God’s strength, not our own, and we get more Grace. The Apostle Paul received infirmities, a ‘thorn’ from the Devil to keep Paul humble. Paul asked for it to removed, but God insisted that Paul rely on Grace to face his challenges. Why does God want us to rely on Grace when we are in difficulty? So, we can be humble rather than proud in our own efforts, and therefore be exalted with power. So, we can reject this world and draw closer to God, being more of Christ’s righteousness – a people with whom he can have fellowship. …Submit yourselves therefore to God. Resist the devil, and he will flee from you. So we can know God, and not be rejected on that day (and be saved). So we can rack up wins for the Lord. We win and win and win by overcoming. So, we can be clothed in the only clothes that matter… those of Christ’s. The righteous acts of those led by the Holy Spirit. As we put on more of these clothes, we truly become more like Christ. Perhaps the greatest tragedy is Christians who once were connected to God with Grace, but lost contact – and they don’t even realize it. They chose comfortable living over affliction. They didn’t take up their cross daily. Christ says ‘when ye fast’ not ‘if’. For Blade Runners, the Blade is not smooth; it is jagged. By running a jagged blade, dangers abound: you could get cut, you could fall off, you can get lost. You are almost forced to constantly cry out to God for more help in daily life – more Grace which builds your relationship and trust with God. And, we need to rely upon God for the big issues and the small things of life. When we are not reliant on God is when we are defeated. Perhaps you believe that you can be of service to God, and you’d like to volunteer. Perhaps you have a job in mind, and you know that you can do it. No, you do not have Grace. Firstly, God does not take volunteers. Christians do NOT take the initiative. There are no ‘altar calls’ in the Bible. Christ only did what was started by God. Those of Christ are drawn to Christ by the Father. We are chosen by God in advance. Secondly, if you are sure that you can do a job for God, you are not getting Grace. You are not on the edge of your abilities. The rebellion of mankind is to believe that we can do it (whatever ‘it’ is) on our own. But, you might go forward anyway. 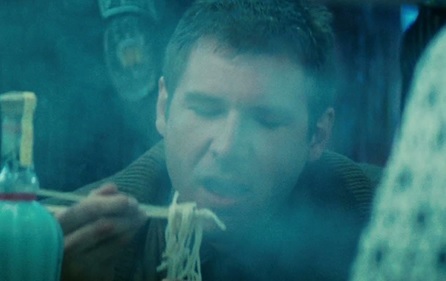 You are a Runner (but not a Blade Runner). You run to follow your heart. You will grow fruit, but it will be corrupt. And you are in danger of the fire. If you are fortunate, God will not cast you into the fire of death, but give you the affliction you need. To be that beautiful woman that is the bride of Christ, recognize the ugly. If God is interested in you, your life might have some barriers in the way of what God wants you to be. The barriers could be the results of your decades of works. They might be your career, your friends, your family, your reputation, your comfort and your pride. Mercifully, God might treat you like proud king Nebuchadnezzar. And God might have to strip you of ALL of your righteous acts/fithy rags. Like any man, Christ cannot resist a naked, broken woman. And the naked cling to the rock. For our failure to be complete, we must die. In order to be dead to The Law which convicts us of our ugly, we must let go of this world for beautiful Grace. …he that loseth his life for my sake shall find it. Our own initiative, our own ‘good’ works, which always will result in an Ishmael, rather than an Isaac, must completely die. When the child of promise, Isaac, arrived – Ishmael had to go. …and serve him with a perfect heart and with a willing mind: for the LORD searcheth all hearts, and understandeth all the imaginations of the thoughts: if thou seek him, he will be found of thee; but if thou forsake him, he will cast thee off for ever. So many professing Christians only go so far, and hold onto that Ishmael, never sending him away, which will always result in the disaster of our own ‘good’ works. So many professing Christians cannot even speak of the central truth of the Bible, one of a woman taking off the clothing of her old ‘good’ works. So many professing Christians are like Demas and retreat into their old comfort: the World Religion of Feminism.